Several times a year, I am tasked with one of my favorite things: planning a family trip. This time, I didn't have to come up with the destination. 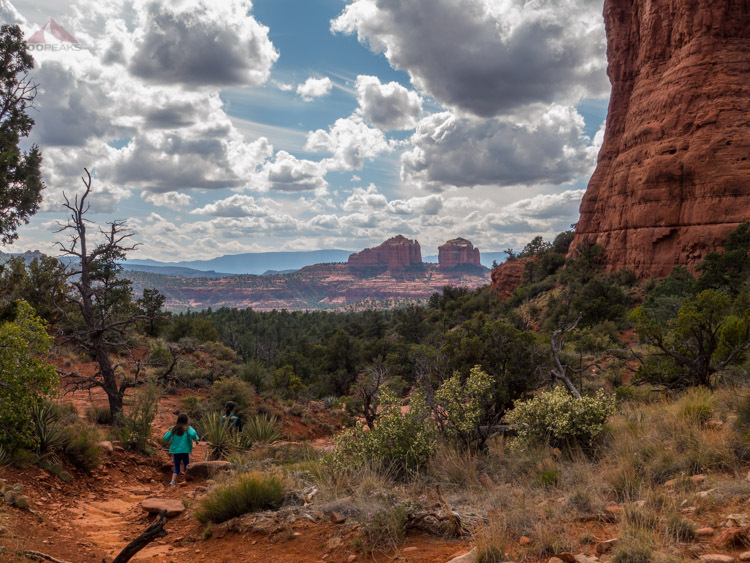 I asked my wife and daughter where they wanted to go and they quickly came up with Sedona. We hadn't been to Sedona since the fires of 2003, when we had to cut our trip short and drive home through the night to San Diego so we could evacuate to Orange County. We felt like there was so much more to see, so we decided to give it another try. We flew into Flagstaff and, seeing lush forests, I was once again reminded that Arizona has many different faces. It isn't just sand and cacti. We made the drive down to Sedona and got settled in. As a family, we are all on the same page. We don't really like to shop. We like to hike, eat, and relax. We tend to have a hearty breakfast, pack a lunch for the trail, hike all day, and then return to town for a wonderful dinner. Our first full day, we headed out to the Red Rock Visitor Center, getting a map of the area and forming a plan for our time here. While there, one of the ranger staff put some popcorn into the microwave for too long, causing an evacuation and a visit by the fire department. After waiting for a long time with no time for re-entry, we decided to head on out for a hike. 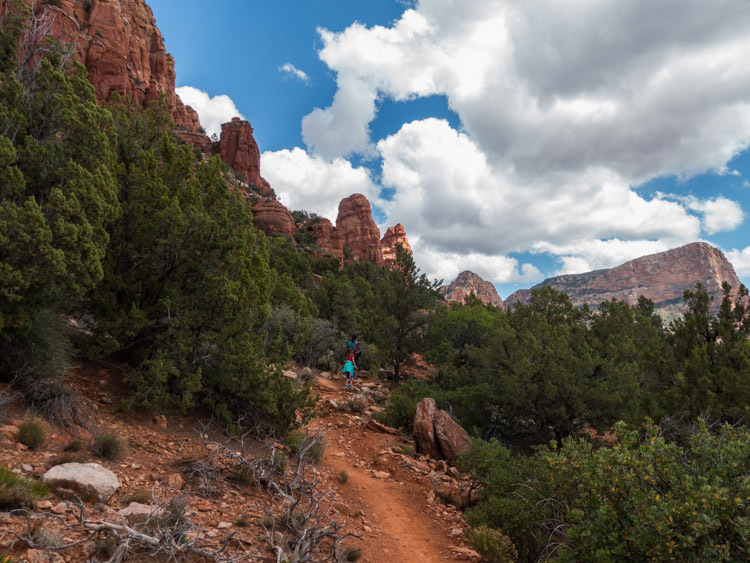 Our destination: Chicken Point, taking the Chapel Trail. It was a wonderful day, a slight chill in the air, and the clouds were amazing, as they would be for the duration of our trip. 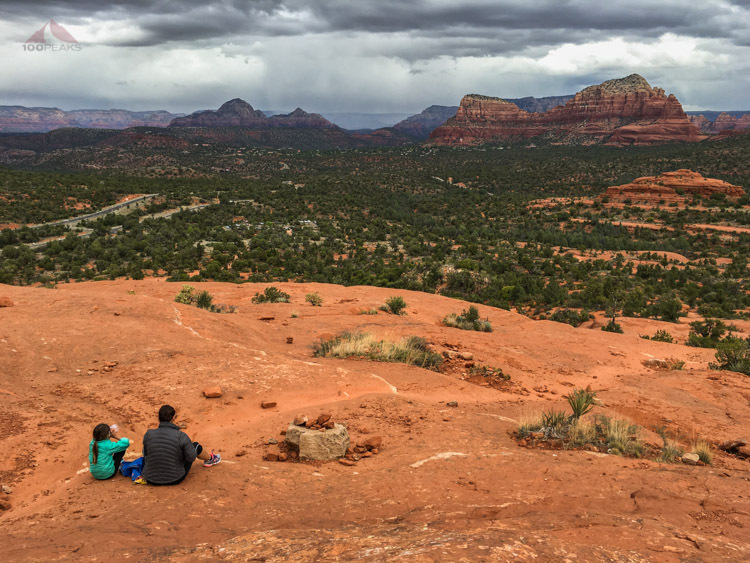 We spent some time hanging out on the top of Chicken Point, getting a nice view of Sedona and watching all the people come to the top from all sorts of different trails. Some pink jeeps drove by and people on ATVs made a U-turn on the red rocks. Since we got a late start, this would be our only hike of the day. The next morning, we got another late start. Hey, we're on vacation. We went back to the visitor center and enjoyed a nice rain shower while we got oriented and received our Junior Ranger information. We then headed out to Bell Rock, one of the many vortices in the area. Once again, we took our time, enjoying the view and our temporary destination. We saw others scrambling in city shoes on the slippery rock to try to get higher. We decided we were high enough and found a nice spot to see the red rocks of Sedona. We then decided to go on a little drive up to the town of Jerome, an old mining town in the hills. I had an ulterior motive, because, as a longtime fan of Tool, A Perfect Circle, Puscifer, as well as Caduceus Cellars, I knew that Maynard James Keenan called this place home. Less than an hour outside Sedona, Jerome is a quaint town, built into the hillside with views into the distance. We tasted some wine, visited his store, and enjoyed the Jerome museum. We headed back down the mountain amid scattered showers and had dinner in Sedona. The next morning, we got up and headed down south toward the M Diamond Ranch, where we had reservations for some horseback trail riding. The staff and horses were gentle and the views were great. We learned that we could easily have ridden for two hours or longer and enjoyed the other animals they kept on the ranch. The sky was stunning all day. On the way back to the highway, we stopped at the V-Bar-V Heritage site, where we went on a short hike to see the largest and best-preserved petroglyph site in the area. It was a pleasant hike along Wet Beaver Creek. The location of the site on private property is a reason why it is so well-preserved. 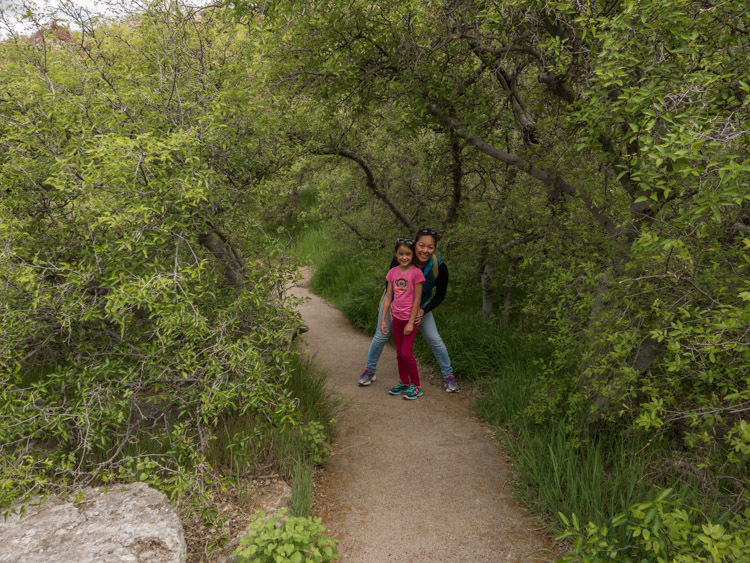 We then drove to both Montezuma Well and Montezuma Castle, both Native American sites that show the ingenuity of Sinagua people in surviving in a harsh desert environment. It was getting late, so we called it a day. The next morning, we decided to drive up to Oak Creek and find a place to hang out by water. We drove along the highway and pulled out at a day use area and followed some use trails down to Oak Creek. Within minutes, Soph had her shoes off and was at home among the rocks and water. It was so much different than the red and green valley below. After a while, the rain started, so we decided to go out for lunch. Next to the tiny Oak Creek Visitor Center, we found a lunch spot, the Indian Gardens Cafe and Market, that was perfect. After finding the eating in Sedona to be hit and miss, we thoroughly enjoyed their food, which we found to be right in line with our style at Burger Bench. Energized with coffee and food, we headed out again, and decided to make Doe Mountain our final hike of our trip. After climbing up a short but steep hike to the top of this butte, we traversed to the far side and were presented with yet another gorgeous view of Sedona. Knowing this would be our last hike of the trip, we lingered again, enjoying the vibe. I had to do some business, ordering beer kegs for the upcoming weekend for the restaurant, but thoroughly enjoyed this place. Hardly anyone was up there, and we had it to ourselves for quite a while. As the day got older, we had to get up and head down. 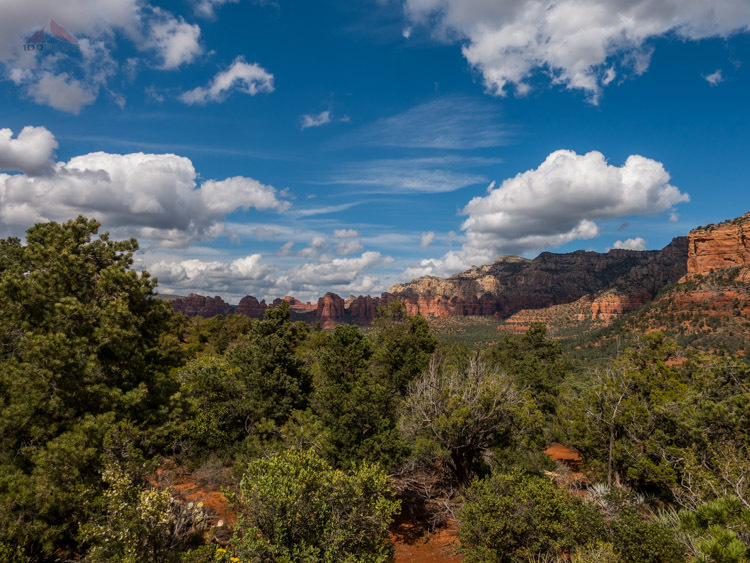 Even with the rain, Sedona was a hiker's paradise. Although there were many places we didn't get to see, we felt like we got our time's worth.